LINE continues to climb the ranks of the messaging service world by reaching the 300 million users mark. Brown, Cony, James and Moon all have been seen by millions of faces because Asia can’t seem to get enough of LINE’s fun mascots and stickers. Roughly 80 percent of the business now occurs overseas, even though 50 million of those users reside in Japan. Thailand and the Philippines are totally smitten. Spain has jumped aboard with its biggest football clubs now partnering with the service, and even Indonesia and India are getting in on the act, two of the world’s most populous countries. Turkey, Western Europe, and other Spanish speaking countries make up the remaining user base. No statistics on America yet, but after watching that accidentally epic video, I don’t see how you can say no. It’s oddly touching. In fact, the number of users has doubled since April, when it stood at 150 million users. 7.2 billion texts and stickers are sent on an average day, and a total of 568 years has been spent with LINE’s free voice chat. The most popular stickers have been sent a staggering 216 billion times. The original characters remain the most popular, but new characters and stickers are added every day. The most recent surging stickers are a half-priced bunch with all profits going to help victims of the deadly Typhoon Haiyan in the Philippines. So while it still might have a ways to go to catch up with Facebook and Whatsapp, LINE has established itself as a mainstay of the instant messaging world and has a very healthy and growing user base. Morikawa claims that that company is aiming for 500 million users before the end of next year. Los Angeles, CA – November 25, 2013 – LINE Corporation, owner and operator of the free call and messaging app LINE, today announced that it has exceeded 300 million registered users worldwide. Since its launch in June 2011, LINE has gained rapid acceptance as a global communication app with its voice and video calls, and wide array of sticker messaging features. 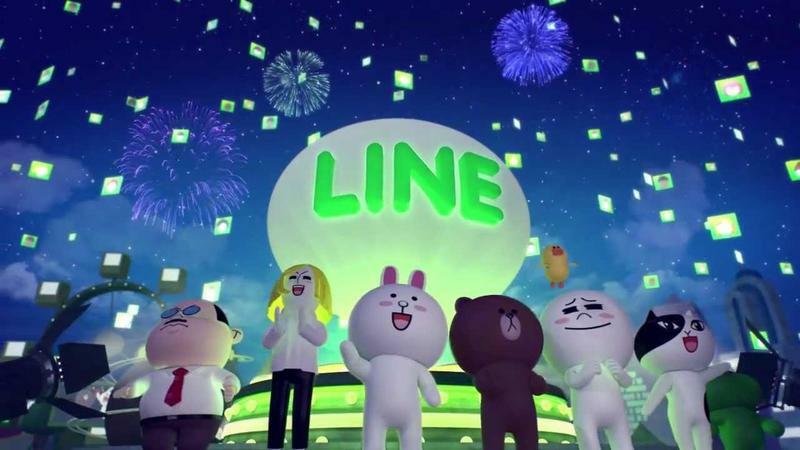 In addition to East Asia, where LINE already has a strong foothold, registered users are growing steadily in Spanish speaking regions such as Spain, Mexico and Latin America. Currently, the company is focusing on gathering new users in India, Turkey, and West European countries including France, Germany and Italy by conducting localized promotional activities and strengthening partnerships with local mobile network operators and device manufacturers. In India, where the smartphone market is expanding rapidly, offering localized content and stickers featuring local celebrities has enabled LINE to reach 10 million users just three months after officially entering the market. 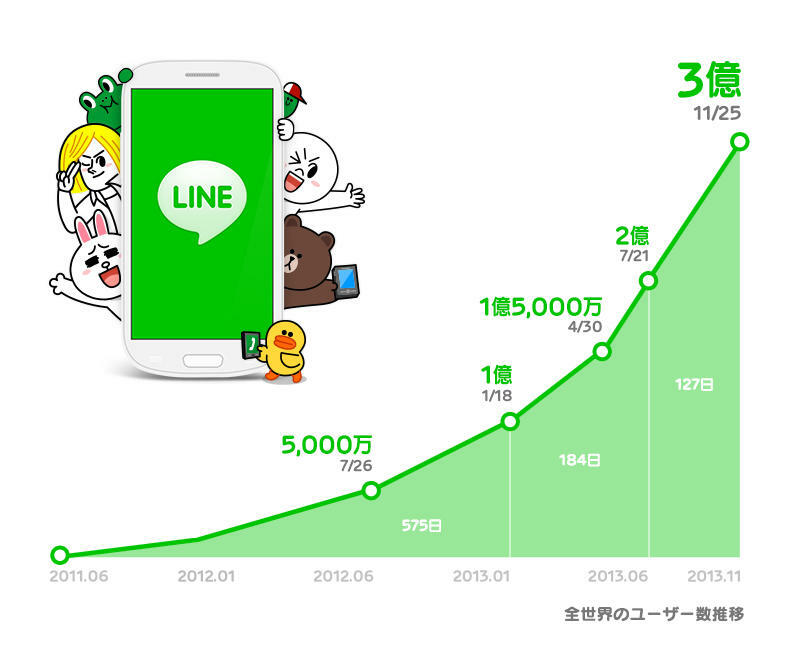 Furthermore, LINE user uptake is accelerating exponentially. Although it took LINE 19 months to reach its first 100 million registered users, the next 100 million registered users were achieved in just six months. In the past four months, however, the LINE registered user base has already grown by an additional 100 million bringing the total to 300 million users. “We are extremely pleased to have achieved our target of 300 million users for the year such a short time after reaching 100 million users in January,” said Akira Morikawa, CEO of LINE Corporation. In addition, LINE is proud to announce the one year anniversary of its popular service, LINE GAME, which enables users connected via LINE to battle with their friends through various games. Currently, the total amount of global downloads across all LINE GAMEs exceeds 220 million. Also celebrating its one year anniversary is LINE PLAY, an avatar creator and suite of virtual environments that users can customize and use to communicate creatively with their family and friends. Following the success of this recent milestone, LINE will continue to work towards enlarging its user base as a global communication service, and enriching the lives of its users.